IN the blockbuster film Titanic, Leonardo DiCaprio's role could have easily been played by a Black man and it would have been historically accurate. In fact, the life story of Haitian native Joseph Phillippe Lemercier Laroche is far more intriguing than the movie's lead character, but no one knew of his existence until recently. "It is strange that nowhere in the copious 1912 press descriptions of the ship and the interviews with the survivors was the presence of a Black family among the passengers ever mentioned." Until now, that is. Eighty-eight years after the biggest ship disaster in history, and three years after release of the Titanic movie, the story of the only Black man to perish in the 1912 disaster is being revealed, thanks to the Chicago Museum of Science and Industry, host to the largest Titanic exhibit ever, and the Titanic Historical Society. Laroche, who was born in Cap Haitien, Haiti, on May 26, 1889, came from a powerful family. Laroche's uncle, Dessalines M. Cincinnatus Leconte, was president of Haiti. The Laroches had been prosperous since the 17th century when a French captain named Laroche (in Haiti on military duty) married a young Haitian girl. At the age of 15, Laroche left Haiti to study engineering in Beauvais, France. Several years later, while visiting nearby Villejuif, he met Juliette Lafargue, the 22-year-old daughter of a local wine seller. Although impressed by the handsome young Laroche, Lafargue's father, a widower, did not allow Laroche to marry his daughter until 1908, after he received his engineering degree. A long way from his privileged lifestyle of Haiti, Laroche found France to be bleak and oppressive. Although Laroche was a cultured gentleman who spoke English and French fluently, and had an engineering degree, he couldn't find a job because of his color. "It was a great disappointment to him that having earned his engineering degree in France he could not find employment there," Geller says. "No matter how qualified he was, the blackness of his skin kept him from securing a position that paid his worth." Laroche's family was growing and there were no opportunities for him to support them. The couple's first daughter, Simonne, was born a year into the marriage, and their second daughter, Louise, was prematurely the following year and was sickly. They were living in Lafargue's home, and the mounting medical bills for baby Louise were draining the wine seller's profits. Laroche, a proud and hardworking man, grew tired of having to rely on his father-in-law's generosity and decided to return to Haiti, where he would be guaranteed work in engineering. Juliette Laroche was initially skeptical about abandoning her elderly father, but soon decided the move would be best for the family, especially for their ailing daughter. The family's plan to travel to Haiti was hastened, however, by the news that Juliette Laroche was pregnant once again. According to historian Geller, Laroche's mother was so overwhelmed that her son was coming home with his new family that she purchased tickets on the French liner La France as a homecoming gift. When the couple realized that their children would not be permitted to dine with them on the liner, they exchanged their La France tickets for second-class reservations on the Titanic, which was the largest and most lavish ship built prior to that date. The style of the decor on the vessel ranged from Italian Renaissance to Georgian, and the cost of a first-class parlor suite was $4,350, equivalent to $50,000 today. The Laroche family boarded the "palace of the sea" on Wednesday, April 10, 1912, at Cherbourg, France, for the scheduled five-day crossing to New York. Never before had the richest people in the world flaunted their wealth so prominently. The first-class passengers constituted the creme de la creme of Anglo-American society. Collectively they were worth over $500 million, with the richest man on board, John Jacob Astor, having a net worth of $30 million alone. The second-class passengers were the middle-class business leaders and managers of the community; and third-class passengers (or steerage as they were called) were primarily English, Irish and Middle Eastern immigrants in search of a better life in America. The Laroches did not have first-class reservations, but Laroche made it quite clear that his family was second-class to no one. The couple shared many of the spoils enjoyed by the first-class passengers. Their lounge was a large, spacious room with paneling in sycamore and was comparable to first-class accommodations on other sea liners of the day. Laroche, like other second-class passengers, also dined in the same saloon as the first-class passengers. 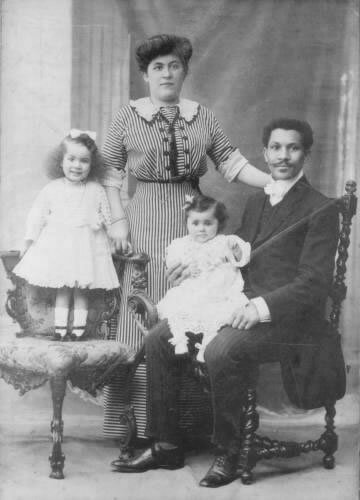 Yet, the family's second-class tickets did not shield them from the stares and insults of being the only multiracial family in a sea of upscale Whiteness, and it is almost certain that the Laroches were frowned upon because of Laroche's Black skin and his interracial marriage to the olive-skinned Juliette, who had dark eyes and thick dark hair. The Laroche children were decidedly of mixed heritage. Fellow passenger Kate Buss told a correspondent in a letter: "There are two of the finest little Jap[anese] baby girls, about three or four years old, who look like dolls running about." According to a few survivor reports, the Laroches were a handsome couple who conversed freely with some of the other passengers. But their charm did not eliminate the racism that was rampant aboard the ship, especially among the crew members. According to Geller, the crew centered their attacks on the "Italians" (a generic term used for all of the darker-skinned passengers onboard). The White Star Line, the company that owned the Titanic, was forced later to issue a public apology for the derogatory statements made by the crew during the final moments on the doomed ship. The Laroches apparently disregarded the racial insults and enjoyed their mini-vacation aboard the sea liner, dining and socializing with some of their fellow passengers. The couple had good reasons to look to the future##they were young, and in love, and had everything in the world to celebrate. Laroche was anticipating the birth of a son, who would be his namesake, and who would be raised in his homeland. It brought Laroche great joy and relief to know that his family would be entitled to a good life in Haiti, void of the racism and poverty that had plagued him so in France. So the days passed, Wednesday, Thursday, Friday, Saturday, bringing the Laroches and their fellow passengers to the unspeakable horror of Sunday, April 14, 1912, the day of the most tragic event in maritime history. The Laroches ate a hearty breakfast on that Sunday and attended church services with some of the other passengers. Later, some of the first- and second-class passengers strolled the decks, while others relaxed in the steamy Turkish Bath (a sauna). Well-dressed ladies sipped coffee and expensive teas in the Cafe Parisien, while the gentlemen confined themselves to fine wine and cigars in the smoking room. Little did the passengers know that at midnight, the Titanic dreamboat would become a monstrous, floating hell. Some historians say the basic problem was the titanic-sized egos of the crew##they felt superior and invincible aboard the largest moving object built by man. In hindsight, the crew had every right to feel safe. After all, the White Star Line had issued a brochure for the Titanic which stated that the vessel was "designed to be unsinkable," and Shipbuilder magazine said the ship was "practically unsinkable." Another problem was that the crew failed to take elementary precautions. On the morning of the disaster, Captain Smith canceled the lifeboat drill with the passengers and crew, which was customary after church services on ships. In fact, the Titanic crew had never gone through a lifeboat procedure. Worse, the liner only had enough lifesaving equipment for 1,178 of the 2,228 passengers and crew because, ironically, it had been decided that too much equipment would crowd the deck. The original plans called for 64 wooden lifeboats##that number was reduced to 16, so that passengers would have more room to stroll about the deck. This was the situation at 7:30 p.m., or thereabouts, when the Titanic intercepted a warning message from a nearby liner the Californian, which said it was surrounded by ice. At 9:00 p.m., Captain Smith joined 2nd Officer Charles Lightoller on the bridge, and both men agreed that if they saw anything large enough to damage the boat, they would have plenty of time to act. At 11:00 p.m., the Californian wired again that she was surrounded by ice, but the Titanic telegraph operator replied that he did "not want to be interrupted again about ice warnings" because he was busy sending out passengers' messages. Then, suddenly, just before midnight, the Titanic, traveling at approximately 30 miles per hour, the highest speed it had ever achieved, hit a mammoth iceberg, causing five of the watertight compartments to flood. Chaos erupted. Realizing that the liner could remain afloat for less than two hours, Captain Smith ordered the 16 lifeboats and four collapsible boats ready, and shortly afterward, women and children began boarding the lifeboats. Of course, the definition of "women and children" varied, as the evacuation process was unofficially labeled a survival of the richest. "In the popular imagination," historians Zero Z. Batzell Dean and Eric Klocko wrote in Children on the Titanic: Tragedy & Class, "men gallantly refrained from entering the limited number of lifeboats in order to allow the women and children to escape. Nevertheless, one had a better chance of surviving as a first-class man than as a third-class child." All hell broke loose as bone-chilling sea water swept through the cabins. Many passengers##so dainty and refined just hours earlier##had become panic-stricken marauders, bribing and threatening crew members for access to the lifeboats. Some women refused to board the lifeboats, determined not to leave their men behind. Still others, paralyzed with fear, were trampled like rag dolls by men scrambling to find their families. As the crisis deepened, with passengers and crew screaming, cursing and crying, crew members began to verbally attack third-class immigrant passengers, who were well aware that they would be left behind to die. Historians agree that Laroche was calm and heroic. Despite the pandemonium around him, he managed somehow to load his wife and daughters, possibly into lifeboat No. 14, which launched the port side at around 1:00 a.m. Laroche probably consoled his wife with frantic kisses and sweet promises of catching the next boat and reuniting with her later##but they both knew they would never see each other again. The last lifeboat left at 2:05 a.m. Seconds before the liner went under, a number of third-class passengers, many of them women and children, surged from below deck. At 2:17, the ship's bow plunged under, the lights blinked and went out. From her lifeboat, Juliette Laroche watched in horror as the stern turned sharply upward, pointing to the sky, and finally sank to the bottom of the ocean, taking Joseph Phillippe Lemercier Laroche and some 1,500 other people to a watery grave. What did Joseph Laroche do during his final moments? Did he curse his fate, or did he stand with the other doomed passengers and listen to the Edison Concert Band play "Nearer My God To Thee?" No one knows for sure, but given his courage, it is likely that he made peace with his ending and died with courage and valor. Almost half of the bodies of the victims were later recovered, but the body of Joseph Laroche was never found. Contrary to popular belief, most of the passengers who lost their lives in the tragedy died from hypothermia rather than drowning. The temperature in the salt water dipped below 35 degrees, which even caused fatalities in the lifeboats. Juliette Laroche and her children remained in the frigid lifeboat for hours, without food or diapers. Surrounded by wailing widows and floating bodies, Juliette Laroche pressed her daughters to her bosom to give them warmth, while her own feet were blue and frozen stiff. Finally, six hours later, the rescue boat Carpathia rescued the 705 Titanic survivors and delivered them to safety in New York. Juliette Laroche and her children received medical attention at St. Vincent's Hospital in New York, where she met philanthropist Hugh Kelly, who provided the family with money, clothes, food and shelter. Poor and pregnant, Juliette Laroche decided to return to France to live with her father. A week before Christmas 1912, Joseph Lemercier Laroche Jr. entered the world, bearing a striking resemblance to his handsome father. This child brought much joy to his grandfather Lafargue, but the war erupting in Europe ruined the winery and thrust the entire family into poverty. On the advice of her father, Juliette Laroche sued the White Star Line for damages, but she filed her case too late. "Lawyers came and went, no settlement arrived and Juliette [Laroche], with her three children, lived in poverty through the first World War," Geller writes. In 1918, six years after the death of her husband, the White Star Line awarded Juliette Laroche 150,000 francs, about $22,119 in 1918 and approximately $254,374 today. She took her settlement and opened a fabric-dyeing business in a room of the family's small home. Although she was now able to support her family, the Titanic tragedy scarred Juliette Laroche for life. Her love for her lost husband never waned, and she never remarried. As the years passed, she held her children closer than even before##Geller suggests that she may even have smothered them with over-protection. "Living in silent fear of losing yet another member of her family, she held her daughter too close to ever give them the opportunity to marry," writes Geller. Neither daughter ever married, had children, or left France. Daughter Louise worked as a clerk in the Justice Department for most of her life, while her sister Simonne cared for their mother who was by this time paralyzed on the right side. The son, who never knew the desperate final moments on the Titanic, enjoyed a very rewarding life, surrounded by the undying love of his sisters and mother. In 1945, he married Claudine, a co-worker at the France Electrical Company. The couple had two sons and a daughter, and once again, the Laroche bloodline was flowing in France, if not in Haiti. In 1973, Juliette Laroche suffered yet another sudden loss, this time her daughter and caretaker Simonne. Seven years later, in 1980, Juliette Laroche died, 68 years after the death of her husband. Haunted in death, as in life, by the events of the Titanic, Juliette Laroche was buried in a grave bearing a tombstone which reads: "Juliette Laroche, 1889-1980, wife of Joseph Laroche, lost at sea RMS Titanic, April 15th, 1912." Joseph Laroche Jr. died in 1987, but his wife Claudine and his sister Louise lived together in the family home until January 1998, when Louise died. Reportedly, the Laroche grandchildren, who live in Paris, have held steadfast to the family tradition of not discussing the Titanic disaster. There is no evidence that the grandchildren ever traveled to Haiti, which suggests that they have assimilated completely into European culture, and that Joseph Phillippe Lamercier Laroche's secret and his proud Haitian heritage are buried at the bottom of the sea with the scattered remains of the Titanic. Can you name the people who died on the titanic from hypothermia? Good research keep up the goog work. Try to keep searching for lost haitian history. I always thought that Haitians could never die in such tragedies like the sinking of the Titanic or 9-11, but after reading this story I can see that I was wrong. Bad things happen to good people, no matter what race or ethnicity. It's sad that Laroche had to die the way he did. But's what's worse is that his memory was never celebrated until eighty-eight years after his death. That was a sad and good story. Just to show you it ever easy for us everywhere we go because of our skin and because we were the first black to say no to slavery. This Haitian men realized Haiti was the best place for his family at that time, but he had a destiny. Thanks to sent me the story.